Recently, much of my work has been influenced by the poets Robert Frost and Mary Oliver. In my paintings, the natural landscape is an entryway to something hopeful and sometimes cautionary, simple and sacred. Accessibility in art is often seen as an insult. “Her work is accessible” is not a compliment. I don’t shy away from accessible – from getting people who don’t always feel comfortable in the contemporary art world to stand in front of my work and absorb it. In my dreams, my paintings are visual representations of the verse of Robert Frost and Mary Oliver. As a landscape painter with strong political convictions, I am caught between my desire to capture a landscape beautifully and signal my distress about what is happening to the natural world. And increasingly – because of human behavior – the landscape is lashing out against us – in the form of storms, water, heat and other extremes. Indeed, given the political climate and the lack of accountable, ethical and scientific people leading governmental environmental agencies, I find myself increasingly preoccupied with how to portray the landscape in a way that makes people give a damn. Indeed, the world is a devastating, ruthless place in many ways. I want my art to be a walk in the woods, a pause in the chaos. A refuge. A realist depiction of what I see has never interested me as much as trying to create something that evokes a visceral reaction. I want to paint a feeling, a mood, a sense of place. While my paintings may merely seem like semi-abstract renditions of New England scenes, a gloominess runs underneath some of them. My current body of work represents what I’m trying to accomplish – combining impressionist and expressionist traditions into semi-abstract paintings, experimenting with both the vastness and the immediacy of water, sky and trees, and trying to render them such that they appear even more magical and otherworldly on the canvas. Julia lives and works in Cambridge, Massachusetts and Gouldsboro, Maine, and holds degrees from Stanford and Yale. 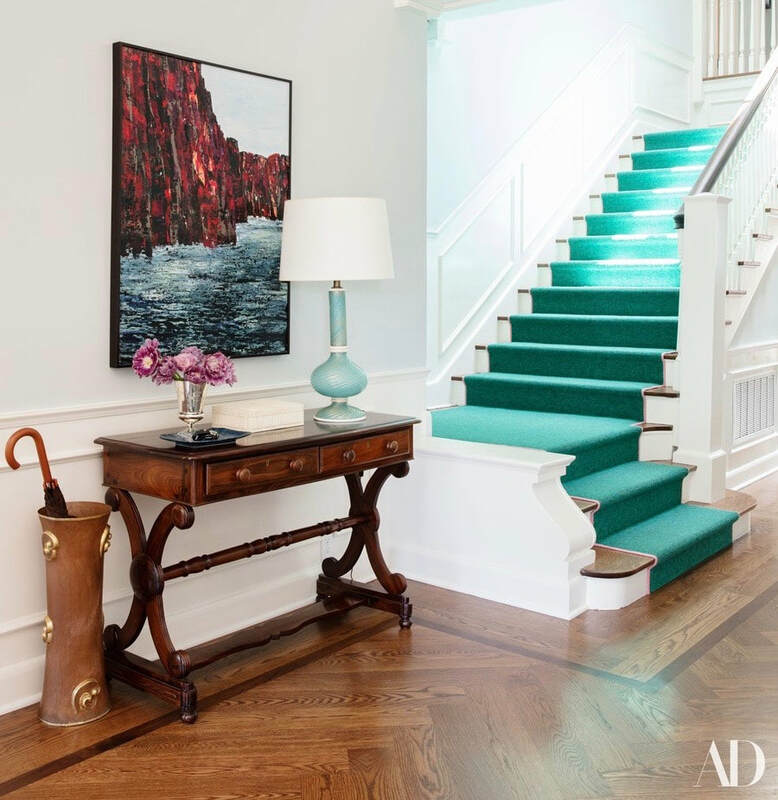 Julia has been profiled in Boston Magazine and Artsy Magazine, with her paintings also featured in Marie Claire Magazine, Architectural Digest and Yankee Magazine. Her paintings have sold at auction at the New Britain Museum of American Art and the Peabody Essex Museum. She was chosen as the VIP print artist for the Museum of Fine Arts (MFA) Boston 2017 Summer Gala. 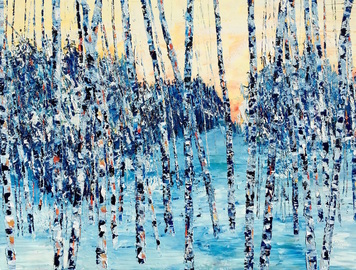 In 2016, Julia’s painting Birch Series 6 was accepted into the juried MFA Boston Summer Auction Show and remains the highest-selling and most bid-on painting in the history of the Auction. Her artwork was also featured on the television show "The Mindy Project" (formerly on FOX and Hulu). Her paintings can also be found in many private collections across the United States, Canada, Europe, and Asia. She has relationships with Abigail Ogilvy Gallery in Boston, Massachusetts, Star Gallery in Northeast Harbor, Maine and Adelman Gallery in San Diego, California. ​A ﻿portion of the pr﻿ofits from the sale of each piece go to benefit two organizations: 1) Agora Partnerships' Accelerate Women Now initiative to level the playing field for women innovators, leaders, and entrepreneurs who are forging the path to a more gender-equal economy in Latin America and 2) the National Resources Defense Fund, an organization that works to safeguard the earth - its people, its plants, and animals, and the natural systems on which all life depends. Ella Fitzgerald, the artist's dog, inspects her work.